Despite internet chatter suggesting people had taken whole days off to stake out the Borders in question, I went renegade and left work at approximately my normal time and headed there. I walked in and the first thing I saw was a staffer at a table with Harlot gear. He handed me my post it and my number (97). I told him I had been to Nora signings and author conventions, 97 was fine. I then tried to find the craft section (accosting a lovely lady looking for the restroom since she had a gorgeous knitting bag, so I thought she might have scoped it out) to try and find the newly released Crazy Aunt Purl book. I found the section, but not the book. I found other knitters. I spread the word of Knitting Daily and the Modern Quilt Wrap that has seduced me. I found a staffer to ask about the book, and after taking me to the section I had just been to, she looked it up and told me that their computer was telling me that it was not available until October. I apologize to the young staffer for arguing (although politely with her). My frustration came from the fact that while I knew the original release date was October, I also knew the book had been released early and had in fact confirmed that morning on the Borders website that the book was in stock at that very store. Sadly, the computer that still said 10/15 won the day. Especially since, with a house-full of book reading knitters, an opportunity was lost. There were men, there were babies, there were folks of all ages. I saw someone with a finished Mystery Stole (I really need to get going on mine). There were sweaters and socks and gloves and scarves and, of course, hats. The Cafe was a little unprepared for hungry knitters, but worked valiantly. There were many, many chairs. I will not even pretend I can do justice to the ninety minutes or so that she spoke. But there were lists. There was talk of knitter prejudice. 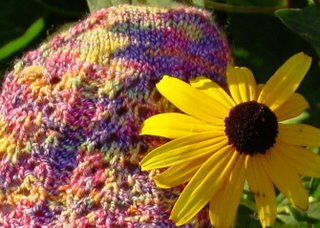 There was talk of how when she tried Knitters Without Borders this past fall she was told by experts that she was setting herself up for failure because fundraising is one thing when there is a disaster but it is very difficult outside such an event and you shouldn't hope for too much. Stephanie talked of knitting and it's wonders, wool and it's wonders. She gave suggestions for handling folks who glimpse your stash and don't immediately say - Wow, is that hand-painted merino?. One bold one included petting it and saying, "These are my kittens!" I may never use it, but I love having it in the arsenal. When Stephanie wrapped up, they moved folks upstairs in blocks. There was knitter chat as we waited. I showed off my Harmony Options needles and worked on something that may go to a swap partner. It was great being with people who - even if they didn't have their own knitting - thought it perfectly normal that I did. Even understood why my bag held a second project. There was a woman who knit a whole scarf on 35's while we were there, and then felt bereft for the remainder of her wait. And the line moved forward and it was my turn. And Stephanie graciously smiled and signed my book and asked about my knitting. And I turned into a teenager. You know, I was polite, I smiled, I answered her question, but I didn't engage. (All due respect to teens, I know you have fabulous moments, but you do know that sometimes you clam up.) So, Stephanie, hopefully the rest of the folks in line were a bit more engaging. And the irony of the fact that I talked to strangers all night long and then apparently lost the art of conversation when speaking to the person I had come to see, is not lost on me. I had a grand old time. 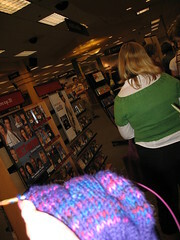 I got the hang with knitters, see the Yarn Harlot, and get my book signed. *Yes, we folks in this area find it funny to talk about crossing borders like it requires a passport. It is for most of us in jest. Sounds like you had a really nice time! Funny how celebrity can affect people. I've heard several people react with a similar pattern to Stephanie in person. What a stitch (pun intended) that UK story about banning knitting! PC gone bezerk!